Surely, just a cyclical negative sideways movement, right? Nothing to worry about, folks. Be confident and jump into the sea of debt!! Debt is much more stable than wealth, too. If housing crashes, your wealth can evaporate but your debt stays solid! So true. Sad. But true. Yup, Assets are an opinion, Liabilities a fact. When “wealth “ is magically formed and secreted in the cracks in the mortar between the bricks of your home it’s not surprising that it might disappear one night . Oh, lah-dee-dah! Mr TT here has a bricks and mortar house! I presume you also have a concrete slab, no? 😂🤣😂 Luxury! Most of us live in holes in the ground, in the middle of the road! luxery………aye ….back when ah were a lad we never ad rooads …….. So what does the Wealth look like if Super, Property Investing and Owner Occupied RE all catch the same virulent dose of the flu. The Super funds are stuffed to the gills with Oz property – their REIT exposures counted as ‘sharemarket’. They have no idea. They’re all sitting on the same bubble of nonproductive debt so they’ll all go down together. The debt looked like it was productive because it was growing and everything sitting on top of it was growing, but it was just a bubble sitting on top of a house of cards. anyone know what “Australian Fixed Interest” is and whether it has any direct reliance on house prices? You can include a high percentage of the value of bank shares as being based on maintaining RE prices. Think what happened to the US bank shares during the GFC due to problems in the real estate sector as an example. We are a three trick economy – RE, holes, and asset sales to overseas interests. It is just a matter of time (could be another 10 years for all I know) and the whole thing will come smashing down. 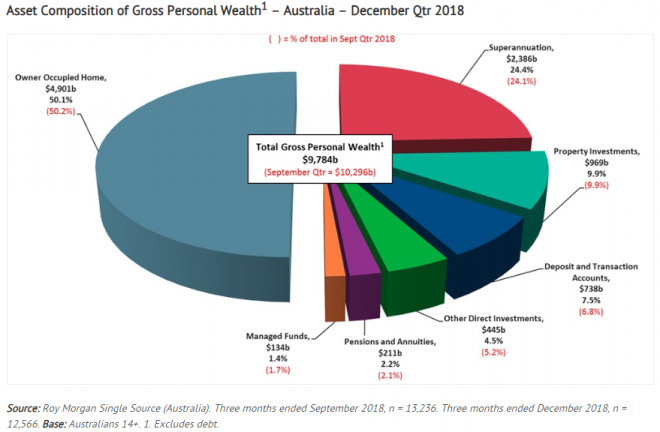 Household net wealth could become minimal on average because the debt will not disappear – bad debt will be bought up at a fraction in the $ and households will still owe these loans. My preference at present is cash and gold mining shares. I may move my cash into govt bonds as a safety play against a possible bank bail in when the sign are propitious. I suppose holding overseas assets is another way to protect wealth, but this also has to managed carefully as nothing is 100% safe. Far out, that must’ve taken a lot of debt to get it that high, and to keep it that high. Better hope that debt is productive debt otherwise we’re going to have a doozy of a time trying to repay that interest on that debt wad! That’s a serious economy-crushing load of debt right there. Probably it isn’t all debt, but a great portion of it will be. For wealth to be lost, the wealth first had to be there. What was there wasn’t wealth, it was never wealth, it was debt. Either their own debt, or someone else’s debt. At the end of the day it doesn’t matter who’s debt it is, it is all fake debt money. Not real money. Debt is and always will be the opposite of wealth. Unless of course you’re a bank. Only banks are banks. People are people, and people are not banks. But a very easy test to see whether it is wealth or debt is to work out how to spend all that wealth that is supposedly owned. If it is required to go to the bank and ask for debt to be able to spend it, then it’s not wealth, its actually debt. Even if the asset is sold and someone hands over a stack of money for it, then if they had to ask the bank for that money to hand over, it isn’t real money. Its debt. Average household over $1million…does this include any debt e.g. mortgages? Excludes debt which means it would be lucky to be half that. 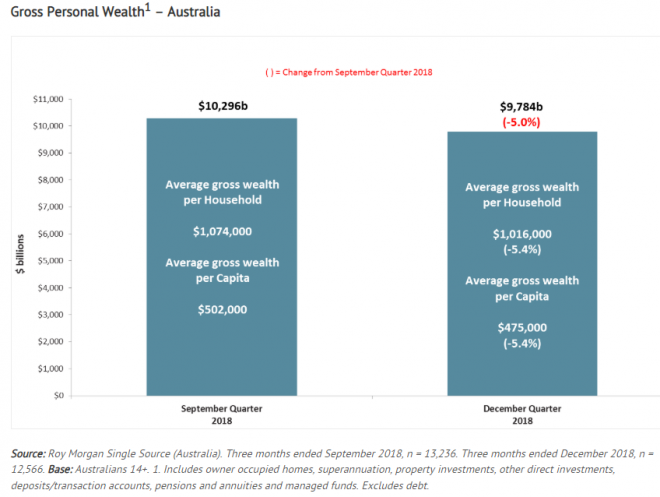 A figure to make Australians feel rich again! Nah I’ll be right thanks Eddie, I’ll just get back to me smashed avo if you don’t mind? Pfft…smashed avo. Get with the times. It’s Uber eats now that’s stopping young’uns entering the housing market. Apparently the kids are all too lazy to walk 200 metres to the shop. Tonight I’ll be eating debt infused fillet streak with financially stressed garlic butter green beans and a side serve of foreign owned potatoes ……. Gross personal wealth, and I don’t imagine the liabilities side of the balance sheet has contracted at the same pace.